The folk at Modus Operandi have evidently been channeling the spirit of mateship in the lead up to long weekend as they’ve teamed up with two top beer venues in different states for their first two new releases of 2018. The first is Sunstroke, a double IPA brewed for the second Hopquest event at Beer DeLuxe in Melbourne’s Fed Square. An unfiltered, tropical fruit focused IIPA, it would appear to be a natural progression from the Future Factory IIPA that closed out 2017 in such a sweet way for the brewery. Sunstroke is based on a relatively light and simple grain bill, meaning the Galaxy, Mosaic, Nelson Sauvin and Cascade hops are left to run riot in a beer the brewery team suggest has “stone fruit and tropical fruit aroma with a pine finish” and “a summery feel to it”. Anyone, particularly those of British heritage, of a certain age and musical interests will likely have "You're twisting my melon, man" as part of their lexicon. It's one of many phrases gifted to the English language by looned poet Shaun Ryder of The Happy Mondays and Black Grape and now it lives on in a beer from Sydney's Northern Beaches. 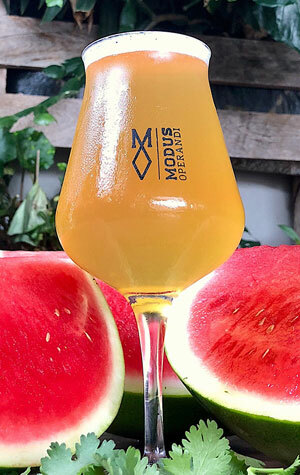 New release number two for 2018 from Modus strays from the brewery’s normal hop forward focus by being (a) a gose and (b) infused with watermelon. Called Twisted Melons, it’s been concocted with the team from Adelaide’s Gilbert St Hotel, who visited Mona Vale over the summer and came up with what seems like a stone cold warm weather quencher. Built on a wheat and pilsner malt base, there was apparently no holding back on the watermelon additions so you can expect plenty of fruit coming through, as well as a touch of coriander "to give it some depth” and “German noble hops to get the balance”. Both beers are keg only releases and will be available in very limited quantities.